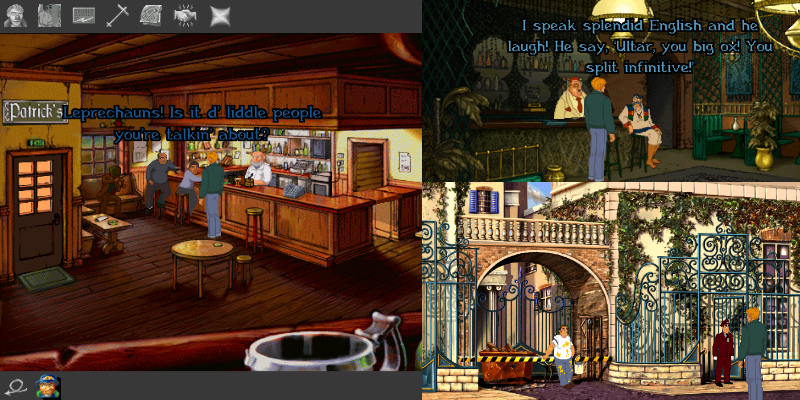 I had never played Broken Sword properly before, I had the demo disc for the PS1, but I couldn’t get off the first screen, and gave up. 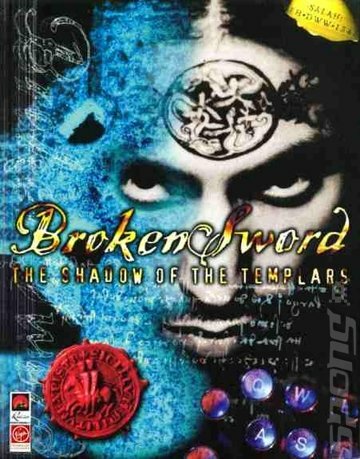 To avoid lawyers getting involved, all I will say is this game HEAVILY INFLUENCED a best selling book, that was made into a mediocre film staring a man who has been “Big” , “had aids” and a best friend called “Wilson”, the book/film basically follows the plot of this game with a few minor differences. I mean it even has an American in Paris falling in love with an exotic French lady! The game starts with you (George Stobart) being caught up in an explosion, planted by a guy in a clown suit. On your journey you will risk life and limb as you, learn about the Knights Templar, the Broken Sword and various double crosses. You’ll visit lush locations, from Paris to Ireland, from Syria to Spain, and finally to a Scottish location which again, is somewhat familiar to the ending in the aforementioned book. 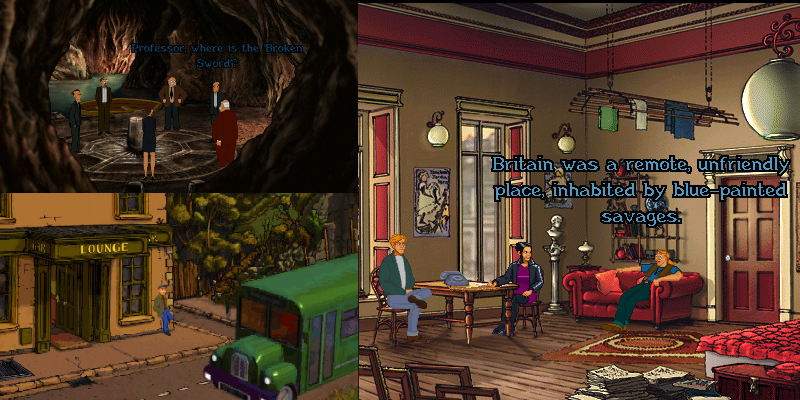 Broken Sword is beautifully drawn, the backgrounds are crisp and detailed, the characters are well animated and the game is scripted perfectly. I fell in love with a number of incidental characters; who, while they were limited to one scene and a few lines of dialogue, they were so well rounded (Fat drunk Newcastle fan on the Train, or Nejo in Syria) and crafted they stick out in memory more than the antagonists (Errrm Eckhart? [I literally just finished the game and I can’t remember the bad guys names]). There is a wicked sense of humour with many allusions to popular British culture. Nejo, for example; learnt English by watch Jeeves and Wooster! I loved that show, but i don’t think anyone outside of the UK would get that reference. There are grammar jokes about “split infinitives”, and some self depreciating British humour about the Scots, and the Irish. Text is also written in the dialectal vernacular, so the Geordie character is almost incomprehensible to most people (even Brits). George’s somewhat slow walk, it feels like it takes an age for him to walk across a screen (but not as bad as Feeble). While not as bad as some point and clicks, the puzzles can be a little obtuse at times. For instance, sometimes you need to right click a person to get the required action. This doesn’t sound bad, but the interactions use the left click. So you will sometimes get stuck, miss a crucial thing, becuase you didn’t right click. This was most infuriating on the ” toilet brush” puzzle. There are a fair amount of backtracking/head stracthing/screaming at the monitor/reading SEVERAL online walkthroughs and discussion forums. Other than that though, the game is superb. I really enjoyed playing this one through, I might bother with the Directors cut, as from what I have seen Nico actually does something. Seriously, in the original version she is functionally useless, she doesn’t do jack (museum bit aside). This is a great game, and you have no excuses to not revisit this game (or play it new). Cons: Puzzles can be a little obtuse, cut scenes are poor, ending? Really, that was the ending? Great review! 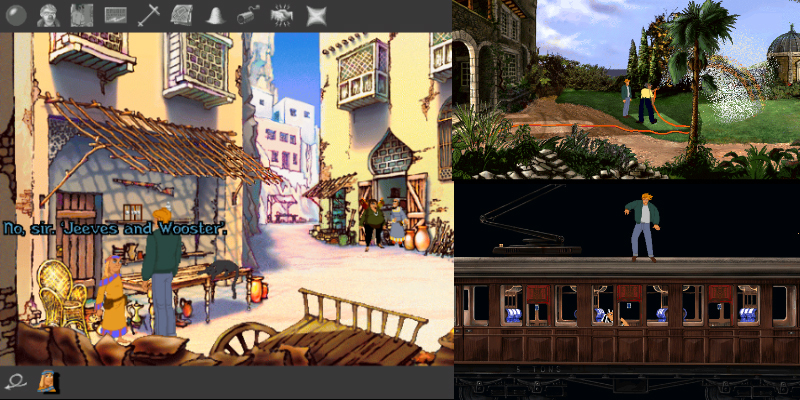 I’d avoid the director’s cut if you’re a fan of the original, they removed a lot of optional dialogue and streamlined the interface. Also the Nico sections add little to the game and feel very ‘tacked on’. Keep you the good work! I actually bought this as the Directors Cut on GOG, couldn’t get that version to work so ended up playing the priginal and never tried the DC! Yes me too, glad they offer the original as it really is the best. You’re not missing much with the DC!